This paper examines progressive forms in an Irish English context. 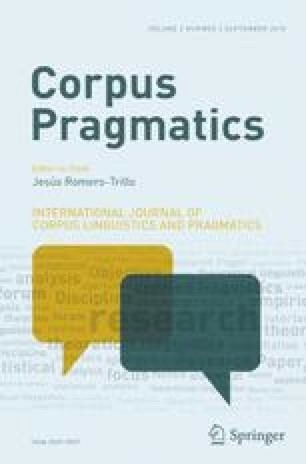 Through corpus based analysis, it identifies a number of non-standard progressive structures which are then isolated for more qualitative discourse analysis, drawing upon past studies of aspect in Irish English, and applying a pragmatic framework, where appropriate, to discuss issues surrounding these structures. The primary data are accessed from the Limerick Corpus of Irish English, a 1-million-word corpus of spoken Irish English, and then cross-referenced using three other corpora including from British and American English, in order to allow for cross-varietal comparisons. The study finds that the progressive acts as a softener in imperative structures or structures with a similar illocutionary force and as an intensifier in the habitual do be V-ing. Of particular note is be going + V-ing, a much-neglected structure in studies of Irish English to date, but which this study found to have a unique syntax and pragmatic function. Burnard, L. (2005). British national corpus sampler. Distributed by Oxford University Computing Services on behalf of the BNC Consortium. http://www.natcorp.ox.ac.uk/. Harris, J. (1984a). Syntactic variation & dialect divergence. Journal of Linguistics, 20, 303–27. www.jstor.org/stable/4175742.